Urban Acreage: Welcome to The Holly House! We closed on our new house! Our furniture won't arrive for a few more days, but no matter! After spending two months alone in a hotel, I'm just stoked to be sleeping in my own bed (on the floor - ha!) and snuggling with my guys! Oh, and the dogs! I missed our dogs, too! Our main goals in finding a home in our new city were: One, a house located on a quiet street. Our first house was on a somewhat busy thoroughfare and we wanted to avoid that this time around. 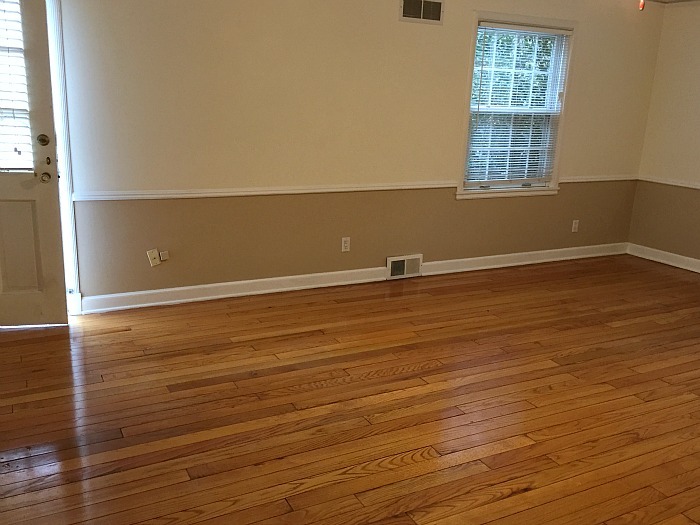 Two, a house that needed updates, but was livable while doing so. You know how we love our projects! Three, a little more space for overnight guests. 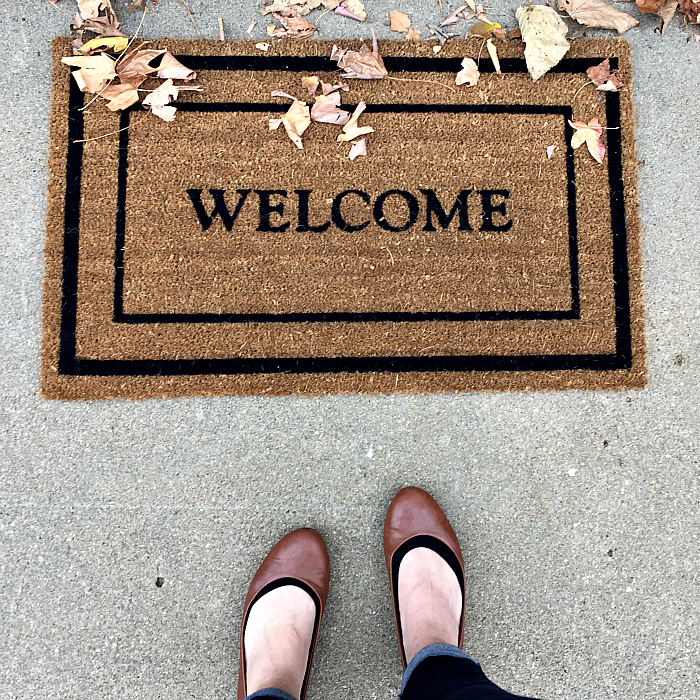 We are living away from family and want them to feel comfortable when they visit. Four, a two car garage with room for Jesse to set up a work space. And five, the boring one, sticking with our budget. I will be the sole earner for a few months while we get settled, and Jesse will be going into business for himself, so we felt most comfortable sticking with something we could afford on one income. Fortunately, you can get a lot for your money in Kansas! After touring dozens of houses, we finally settled on a 1945 colonial about ten minutes drive from my office. 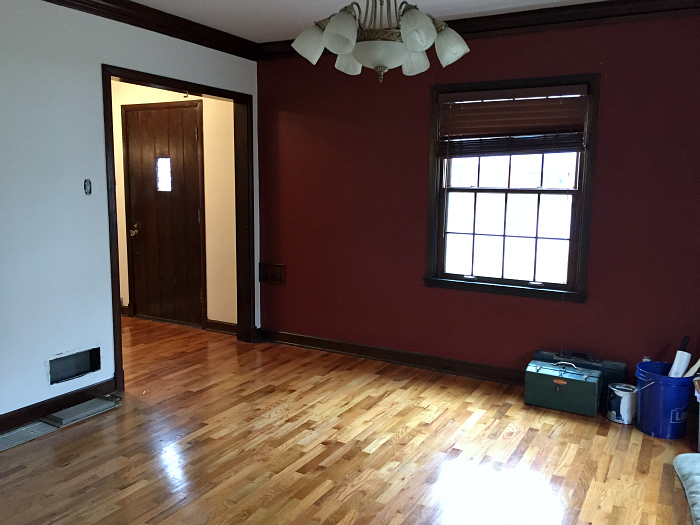 The house is situated on the outer (more affordable) edges of a historic neighborhood that boasts wide tree lined streets, a park with a playground and a volunteer neighborhood association; it feels quite fancy schmancy compared with what we are used to! Let's take the penny tour, shall we? 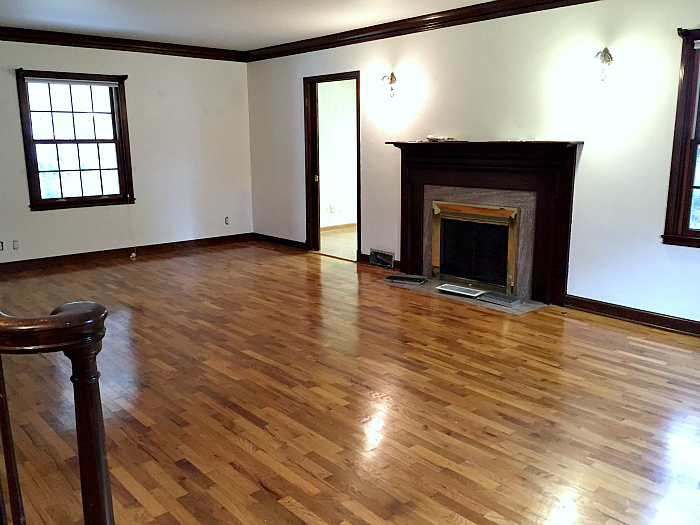 Living Room: It has a fireplace! Unfortunately, it needs work before we can use it. Bummer. We will probably save up until we can replace it with a high efficiency insert, like this. 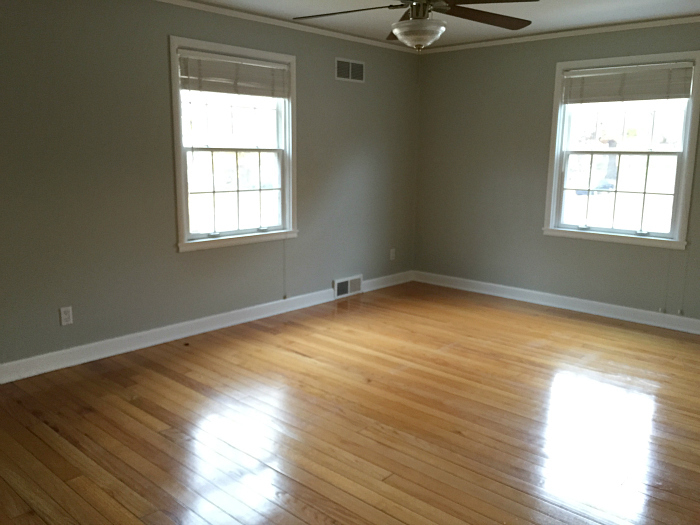 Dining Room: Pretty straightforward, just needs paint and a light fixture that's more to our taste. I also plan to keep an eye out for a credenza of some sort. Kitchen: The kitchen was remodeled with lots of lighting and custom cabinets about ten years ago. 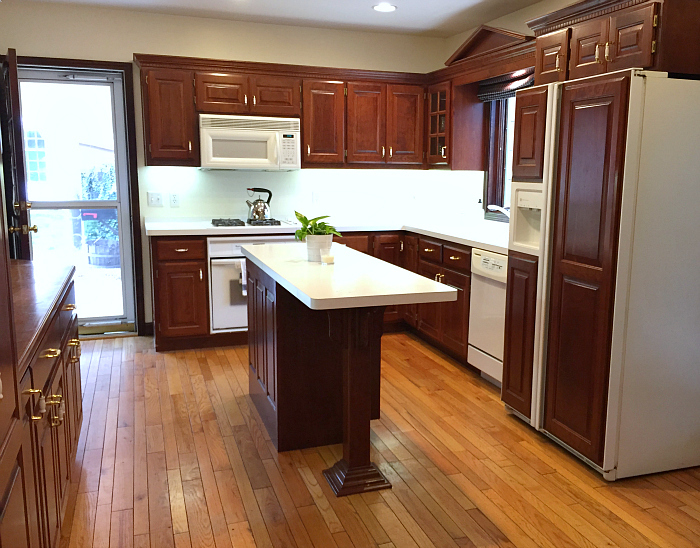 The cabinets are very nicely done, but very traditional. I'm also not too keen on the empty space between the tops of the cabinets and the ceiling. We are going to take some time to think about what to do in here. Kitchen remodels are costly, so it would be great if we could somehow work with the existing cabinets. Powder room: This is located off the kitchen and has dated tile on all four walls and the ceiling. However, the previous owners updated the toilet and sink at the same time as the kitchen and I love how the wood floors continue into the space. I've already started working on the powder room and it's about two thirds finished! Office/Guest Space: This is a little addition off the living room that has a separate bath with shower. Our first major house project will be repairing the ceiling and the flat roof above this room. Later down the line, we hope to install new flooring and drywall as well as update the bathroom. 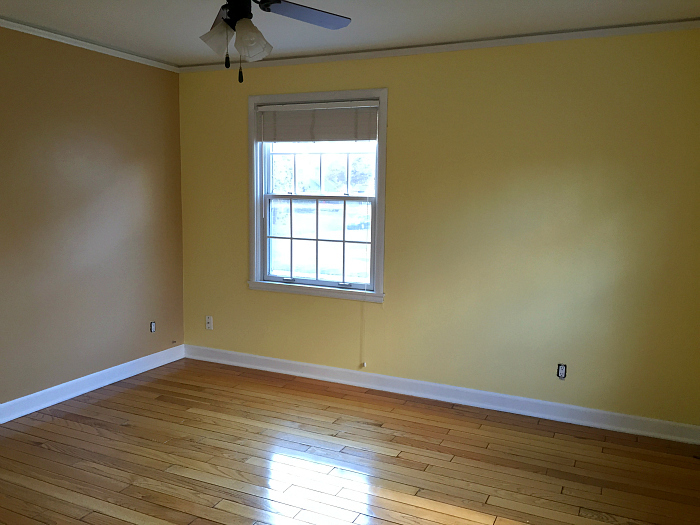 Bedroom One: Similar to the dining room, it just needs paint and a different light fixture. We had a family painting session a few days ago and this room is already looking more spiffy. Bedroom Two: This would also be a good room for guests and I like the wall color. 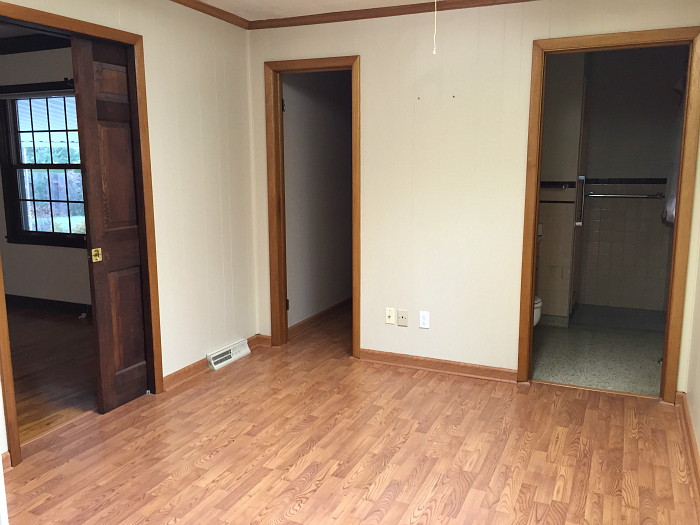 We will probably put our old furniture set up in here and start fresh with the master bedroom. Bedroom Three/Master: This room is much larger than our current bedroom, so I'm really looking forward to decorating it. We've already removed the chair rail and Jesse has started sketching out plans for a bed. My favorite thing about this room though, is the door to the balcony! The balcony: This is located over the office/guest space and, as I mentioned, needs some work. 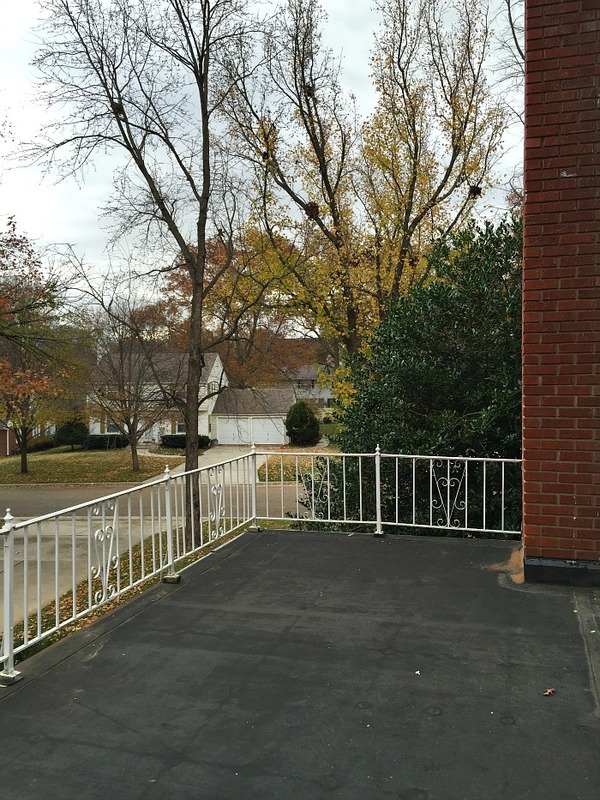 Our idea is to repair the roof and then build a deck with a proper (safe) railing around it. 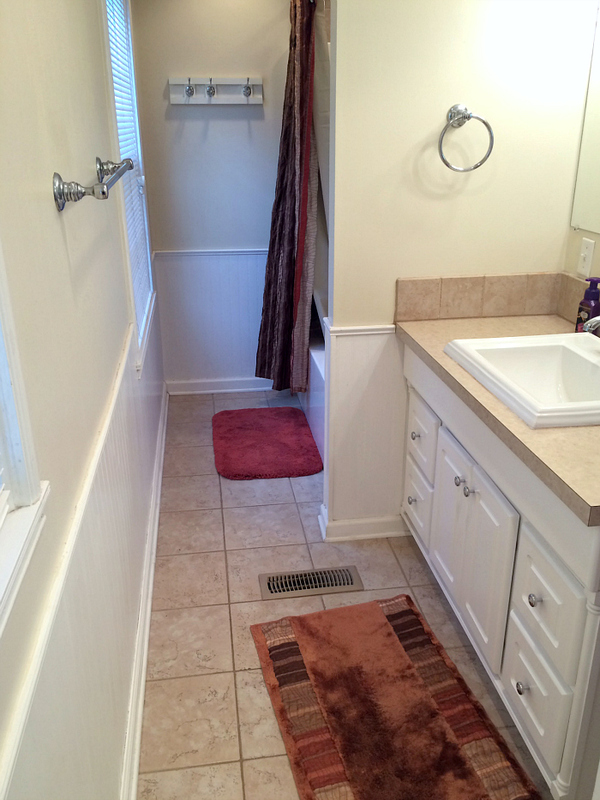 Upstairs bathroom: I think this bathroom was remodeled about the same time as the kitchen. 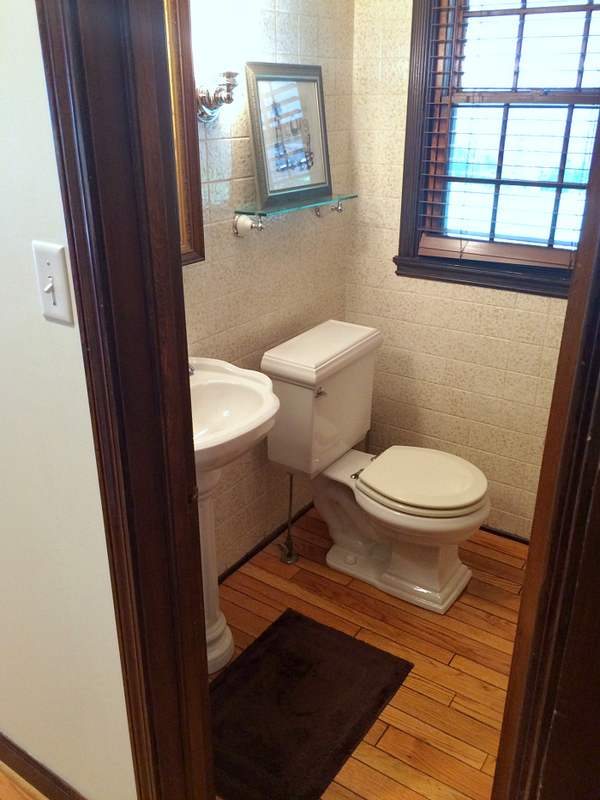 It's a perfectly fine bathroom, but it could benefit from some upgrades and fresh paint. 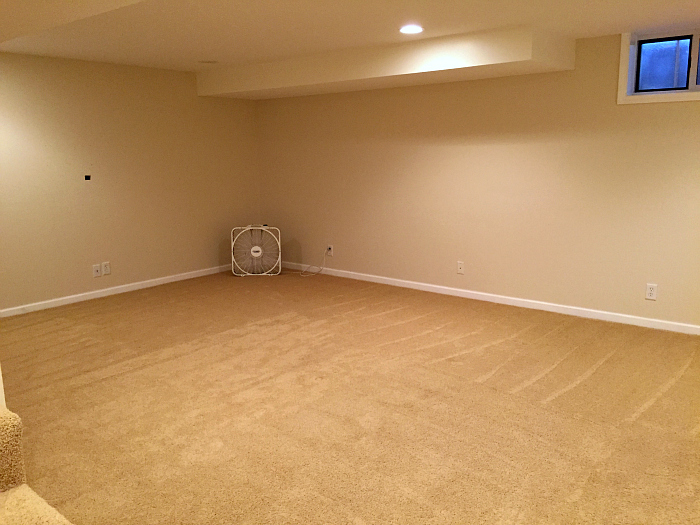 Basement Rec Room: I love that we have a finished room in the basement! However, replacing the carpet is pretty high on my list. It's a high pile plush, which tends to latch onto dirt and pet dander, plus it smells a bit funky, even after having steam cleaned it. That's pretty much it! 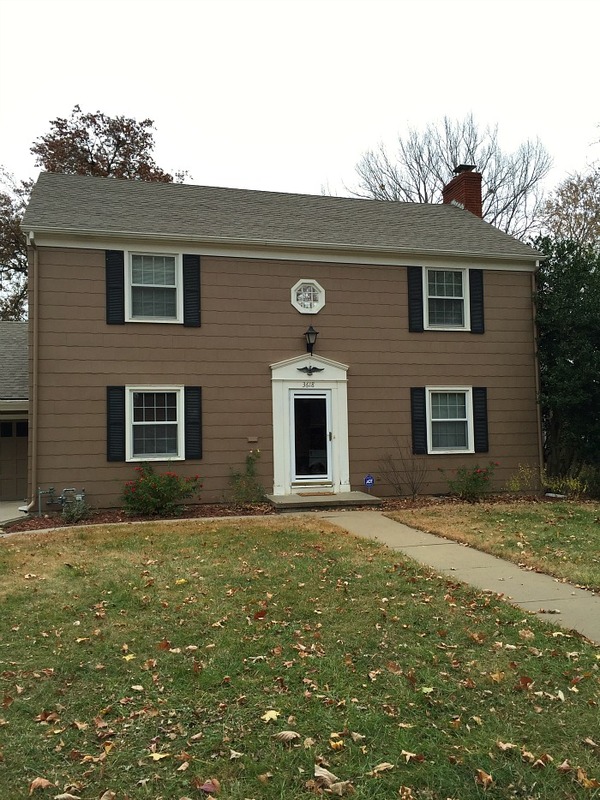 We are so thrilled with this house; it meets all the needs on our list and came with super friendly neighbors - bonus! Thanks for sticking around while I took a mini-hiatus during our relocation, I can't wait to start sharing our projects again!